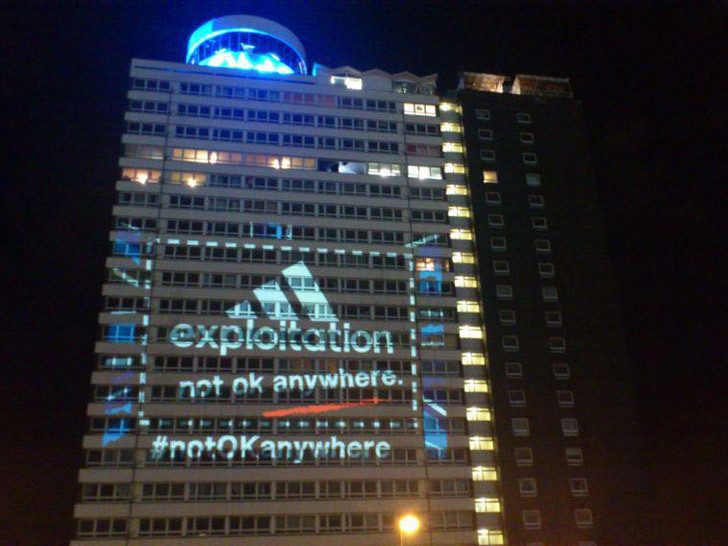 Sweatshop protestors turned a building overlooking Olympic Park into a giant billboard criticizing Adidas for its alleged worker exploitation. War on Want, an anti-poverty charity based in London, beamed the 65-foot-tall projection in time to greet a sellout crowd of 80,000 as they left the men’s 100 meters final on Sunday. Proclaiming “Exploitation: Not OK Here, Not OK Anywhere” beneath the sports manufacturer’s three-striped logo, the video message is the organization’s latest effort to highlight the low wages, abysmal conditions, and physical and verbal abuse nearly 775,000 workers in 1,200 Adidas-contracted factories across 65 countries face. War on Want members accuse Adidas, an official sponsor of the 2012 London Olympics, of raking in £100 million in Games-related merchandise while workers in countries such as Indonesia and Bangladesh skip meals to survive. The protest follows reports that Adidas workers near the Cambodian capital Phnom Penh receive a weekly pay of £10 ($15), are forced to work overtime without compensation, struggle to cover basic necessities, and live in squalid surroundings. As an official Olympic sponsor, Adidas has sold £100 million in Games-related merchandise, according to War on Want. Adidas, however, says it “strongly refutes” War on Want’s claims even as it respects the right to peaceful protest. “We take all allegations about working conditions extremely seriously, but it is very important to note that the independent women’s [non-governmental organization] Phulki, which visits our factories on a monthly basis, found absolutely no evidence to support the allegations being made,” according to a spokesman. If American Apparel can make clothes in the US, provide good wages and benefits, so can Adidas, Nike and all the rest! Sweatshop protestors turned a building overlooking Olympic Park into a giant billboard criticizing Adidas for its alleged worker exploitation. War on Want, an anti-poverty charity based in London, beamed the 65-foot-tall projection in time to greet a sellout crowd of 80,000 as they left the men's 100 meters final on Sunday. Proclaiming "Exploitation: Not OK Here, Not OK Anywhere" beneath the sports manufacturer's three-striped logo, the video message is the organization's latest effort to highlight the low wages, abysmal conditions, and physical and verbal abuse nearly 775,000 workers in 1,200 Adidas-contracted factories across 65 countries face.